Galaga is Michael Kimball’s love letter to the game of the same name, his textbook, his instructor’s manual, his encyclopedia and fan fiction, and is so much more than any of these things. The book covers every nuance of the game, references in pop culture, merchandising, and just about any other thing related to Galaga. Tattoo anyone? He’s got those to talk about, too. No worries. And that’s fine and good, but there’s something Kimball displays with this book – courage and love and survival. How’s that for a magic trick? 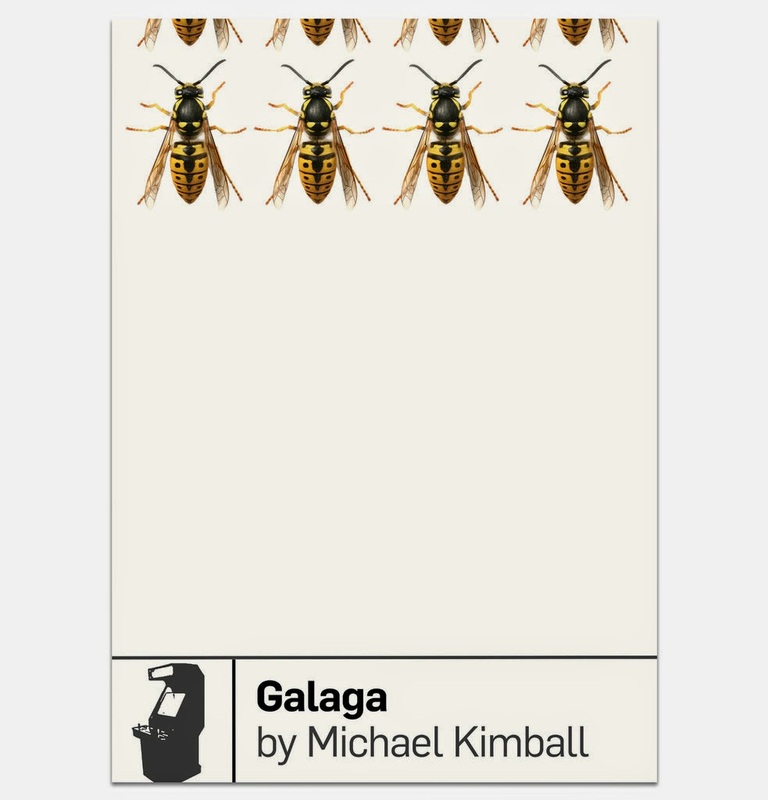 Released July 1 from Boss Fight Books, Galagais a work structured into 255 “stages”. Not chapters. Stages. That’s right, you heard me. Why? Simple. The game itself, the muse as it were, is made up of the same number of stages. Kimball knows this, and hundreds of other things about Galaga, having discovered the game in the arcade at the height of the boom and too long before the bust, when kids were stacking quarters for next in line and Madonna was just painting herself into a pop goddess. Kimball was there, best friend in tow for some of it, living truly free in his own little patch of 1980s paradise. Galaga can work on several levels. Readers can enjoy the areas of the book that deal exclusively with the game itself, or they can read the autobiographical stages, a more human layer, and enjoy it at that level, as well. The stages are mostly brief and strongly built, and rotate from sections devoted to game play and advice and the cultural significance of the game, to sections about anything other than video games. These sections that break away from talk of the game are a testament to Kimball’s bravery as a writer. In these sections, he opens his chest to show the arteries across his heart, those swelled with hope and those crushed from pain. He offers it all. Before Kimball actually pulls us along with him into the complex world of the game of Galaga, we’re given those two sentences. When I read them, I literally caught myself holding my breath. It was unexpected, that’s all. Unexpected in the best possible way, in the way that lights up the heart while the brain is already firing away. All systems go. But this was a book about a video game, right? Well, yes. But then there were these two sentences. By the time I came across the second reference, read it, and moved on, I found myself enjoying the facts and figures about Galaga, but on the look for more from Kimball’s troubled youth. Soon, though, I felt relaxed again. And then, another stage with tension and abusive fathers and brothers and the need for escape and a place to feel safe. And…wait. The pattern of being relaxed and then tense, at least for this reader, began to mirror what the young Kimball must have felt – relaxed and safe when in the safety of the arcade and then tense while at home, a place where he could be attacked at any second without warning. I’ve never said this is a review, but the ending of this fine book is amazing. The duel means by which Kimball presents both the game of Galaga and his life in connection could not be more expertly faded out to its natural conclusion. Reviewer bio: Sheldon Lee Compton is the author of The Same Terrible Storm. He survives in Eastern Kentucky. Visit him HERE.